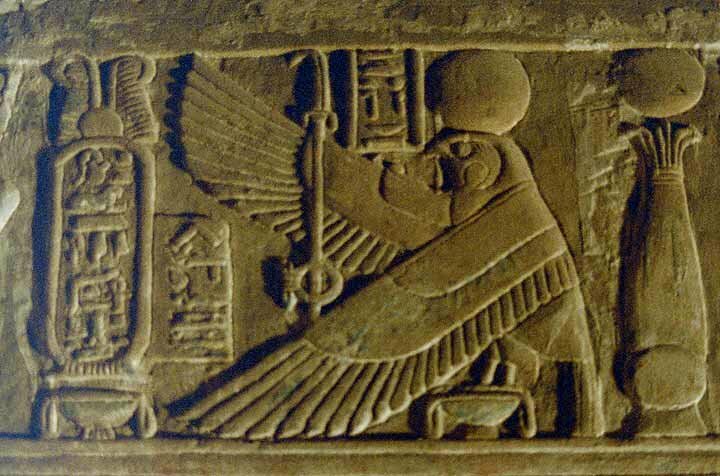 Egypt and Art > Tour Map of Egypt > Tour Dendera Directory > Horus the Falcon. In the depth of the temple, our guide shows us a trap door. Scrambling down a short staircase, crawling through a small opening we find ourselves in a cool, cramped corridor. Lit by a string of electric lights, the walls shine. They are made of alabaster, beautifully carved in low relief. Paint still clings in places while others are polished by the touch of generations. Use the map by clicking on the red arrows.